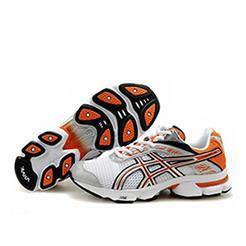 The running shoes that you purchase should be chosen to suit your running style and running surface. We recommend that you only use a specialist running shop to purchase your shoes. They should be able to analyse your gait by asking you to run on a gait analysis machine (a bit like a running machine) and advise on the best fit and style of shoes. If you have this foot type it's just as important to get the correct shoe as with any other foot type. The type of shoe needed for the normal foot is commonly known as a 'stability' type. This is sometimes known as being 'flat footed'. In this situation the foot usually rolls too far to the inside. If you stand with wet feet the imprint of the shape of the foot on the floor is complete, without any arch. As with the normal foot type the running form starts with the heel landing first but the foot lands more squarely and rolls inwards, which is known as 'overpronation'. This causes a lack of stability as the ankles and knees have to work to correct the problem. You need a shoe that will provide support for your foot arch. The correct shoe type is often known as 'cushioned' and will help correct underpronation. The report found each breast moved independently of the body by an average of 9cm for every step taken! Sports bras have been specially designed to absorb the shock of bouncing and reduce stress on the ligaments which cause breast sag. As you begin to think about winter kit please do yourself a favour and treat yourself to a new running/sports bra. Most sports and jogging bras do this but it's always worth checking. Some have patented fabrics that draw moisture very well. When you've found your ideal jogging bra consider buying several. The average sports bra should be replaced after around 30 to 40 washes. Ensure your sports bra is washed at a low temperature and dried naturally to help it last longer. Overall having a good jogging bra will be a godsend and something that will really help you enjoy your jogging more. We take women who are completely new to running or have not run for a long time. We welcome any woman over the age of 16. The majority of our members are between 30 and 60 but we have many older and younger runners amongst our membership. I suffer from asthma. Can I still run? Several of our ladies have asthma. They simply carry an inhaler to be on the safe side. If in doubt, check with your doctor. I’m overweight. Can I still run? Yes. In fact, you’ll probably find that you will lose some weight when you start running, or certainly that you’ll feel and look trimmer. Running combined with dieting is an excellent way to lose weight but, if in doubt, or if you are very overweight, you should check with your doctor first. A sweatshirt or T-shirt and leggings, or track-suit bottoms, are fine. You’ll also find that you’ll need a sports bra. In the summer many women wear shorts or Capri length tights and a running vest but it’s up to you. You’ll want to buy some good running shoes eventually but just wear trainers or similar suitable shoes, at first. If anyone falls over or twists an ankle, there is always a companion available to call for help. We never leave anyone behind, and we all help and encourage each other. Our coaches are all first aid trained and are UK Athletics qualified, and will look after you. The annual membership costs just £30 for a year. Coached runs cost £3.50 each, and you buy a strip of ten tickets which you can use at any time, on any of our runs, so that you only pay for the runs you attend. Do you still run in the rain? Very definitely yes! The weather rarely stops us, and then only if it would be actually unsafe to run. Do I need to buy special running shoes? No, a pair of ordinary trainers will do for a start, but after a while it may be worth getting some advice from a specialist running shop. You will want to buy a running bra as well. You'll burn around 100 calories per mile and running will also help to boost your metabolism. Of course, if you reward yourself for going out on a run by going home and eating a cream doughnut it may take slightly longer for you to shift those extra pounds!